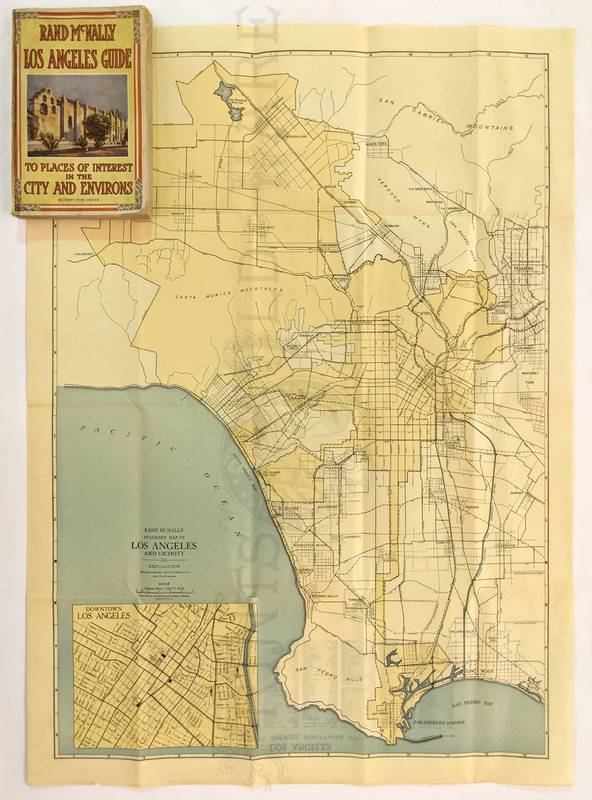 Antique Los Angeles, CA Prints and Maps for sale. Condition: Very good nice margins, only a few noticeable vertical folds with no yellowing. 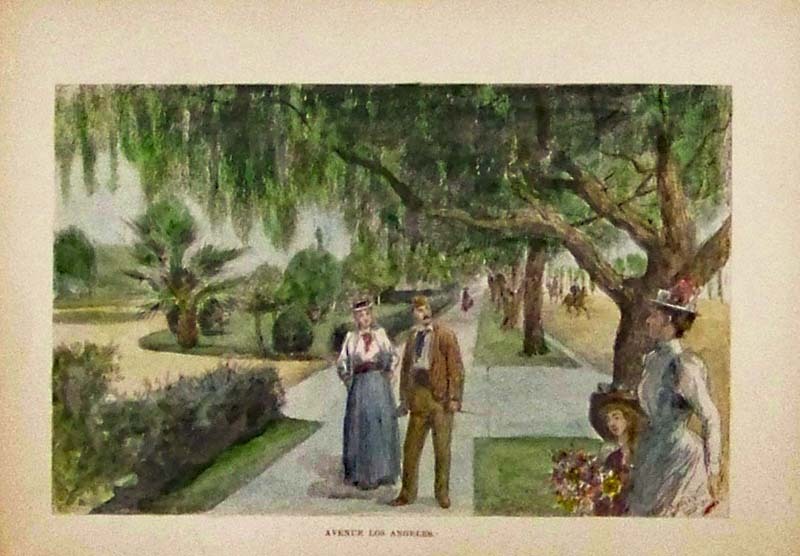 1891 Pasadena Tournament of Roses views. 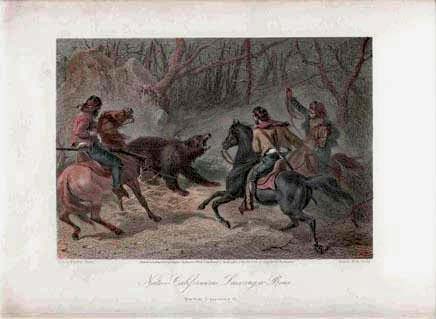 Six hand colored antique engravings on one page. 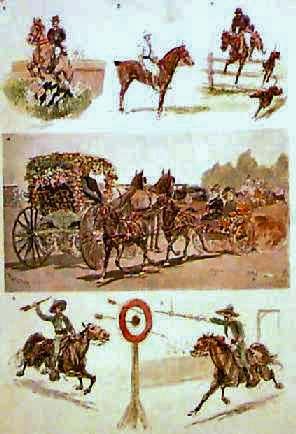 Shows horse riding competitions of California cowboys, and decorated carriages. Harper's. 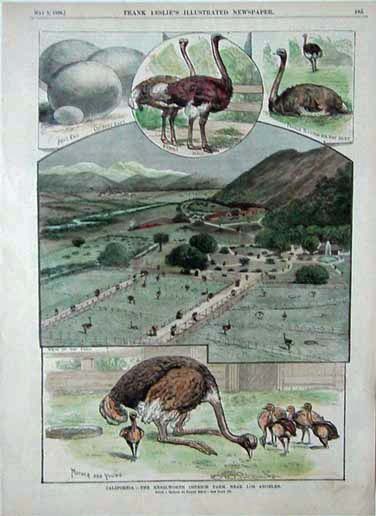 1888 Los Angeles Ostrich Farm print. 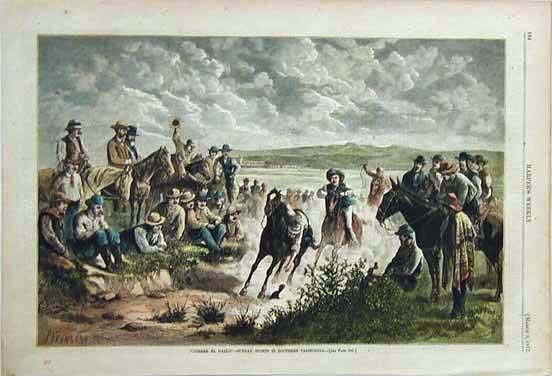 Five hand colored engravings on one Leslie's page. Overview of the Kenilworth farm, nesting female, eggs, mother and young, and male and female. Genuine antique print. 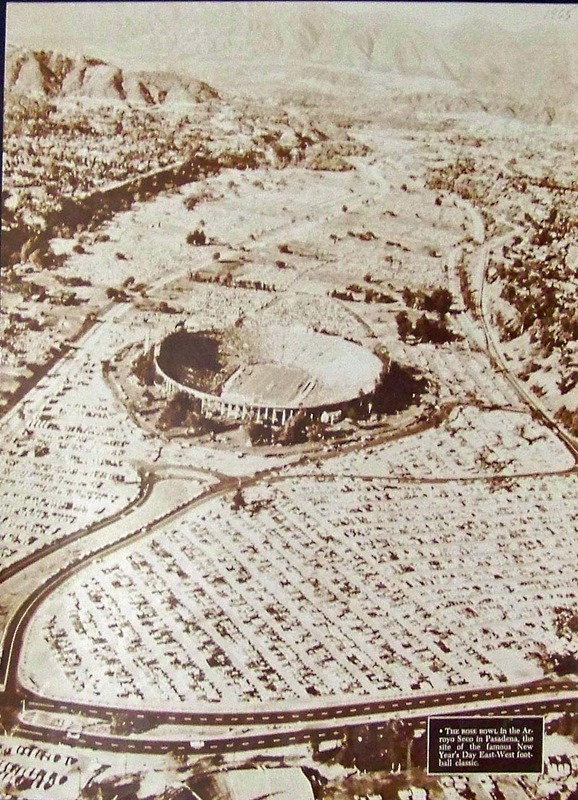 FOREST LAWN CEMETERY, LOS ANGELES, 1944. Pictorial Forest Lawn. 80 pages of photos of grounds, art work, reception rooms, baby land, mausoleums, chapels. Some in color. Good condition. 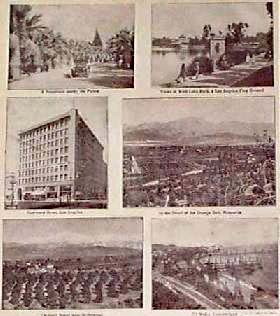 1906 Los Angeles Spring Fiesta views. 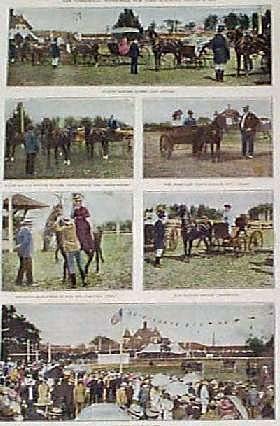 Five hand colored half-tone views of the highly decorated floats in this procession on May 21 & 22, 1906. Original page from Leslie's. 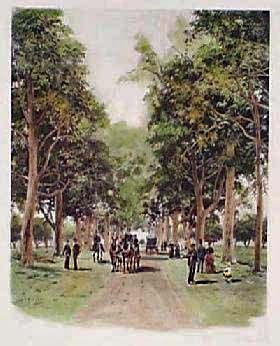 1880 Orange Grove view. 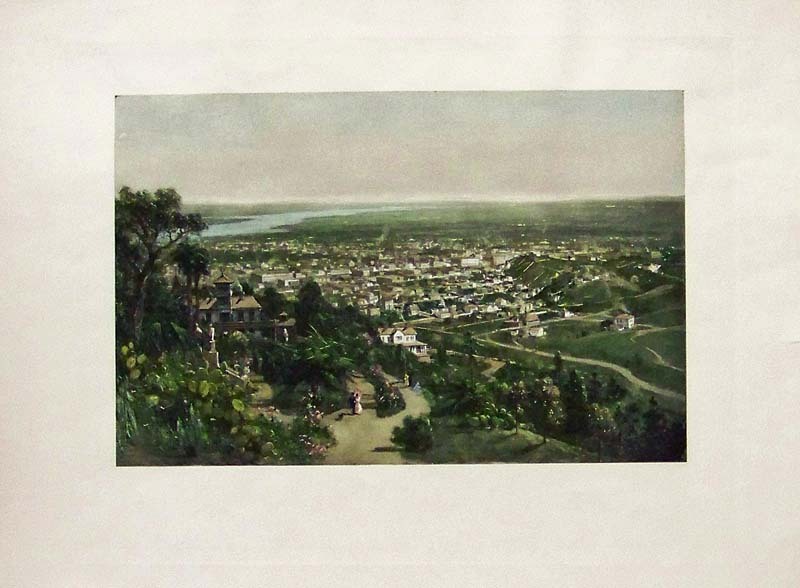 Great looking antique color litho view of the residence and orange orchard of P.J. Shaffer, Orange County. 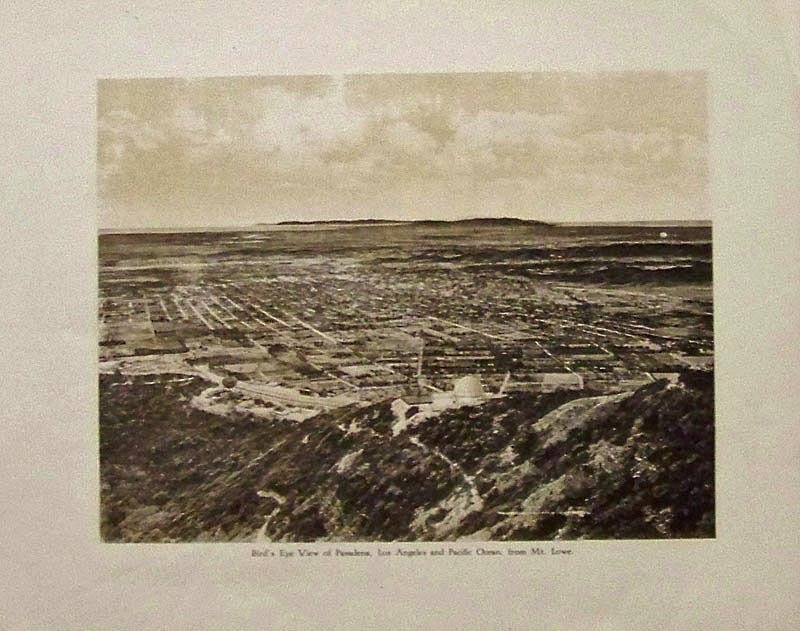 1915 half-tone showing a "Bird's-Eye View of Pasadena, Los Angeles and Pacific Ocean, from Mt. Lowe." 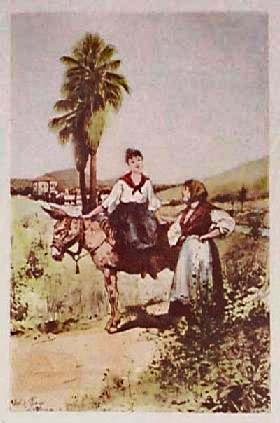 1891 Avenue Los Angeles - Hand colored wood engraving showing a man and woman strolling down a lovely street in Los Angeles. as views of the crowd. 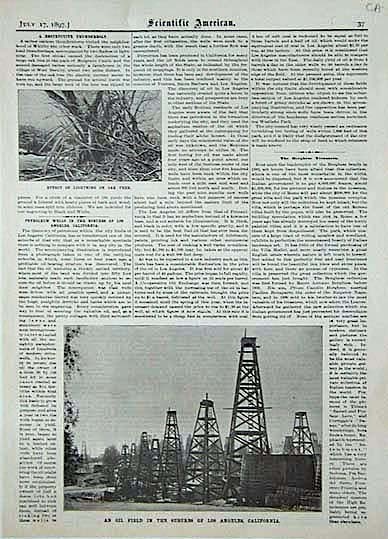 1911 Views in Los Angeles California. 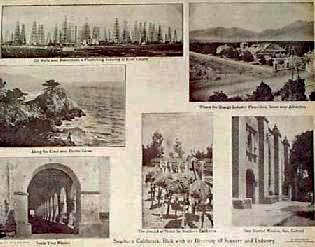 Six photographic views of the Los Angeles area, published in 1911 by the Southern Pacific Co. 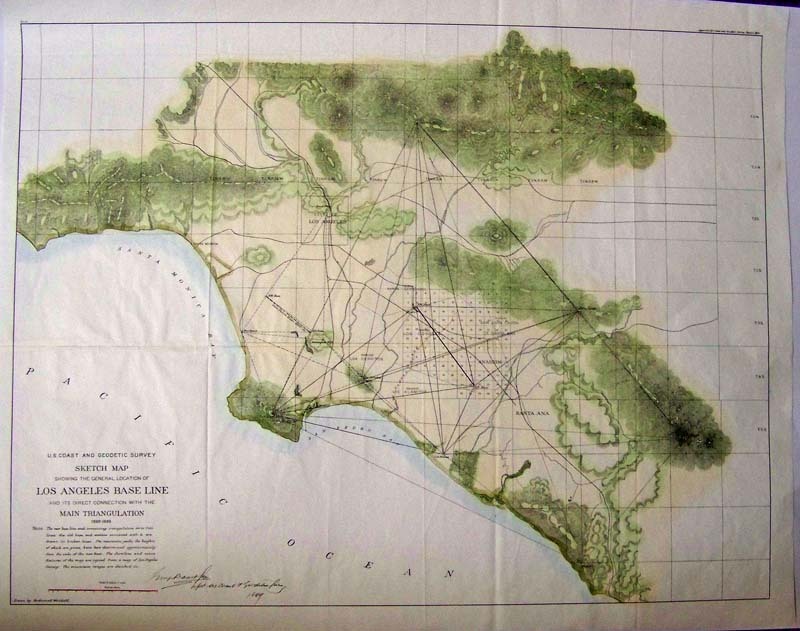 Titles of the images are as follows: 1) A Boulevard Among the Palms; 2) Views of West Lake Park, a Los Angeles Play Ground; 3) Hayward Hotel, Los Angeles; 4) In the Heart of the Orange Belt, Monrovia; 5) Orchard Scene Near Hollywood; and 6) Oil Wells, Summerland. 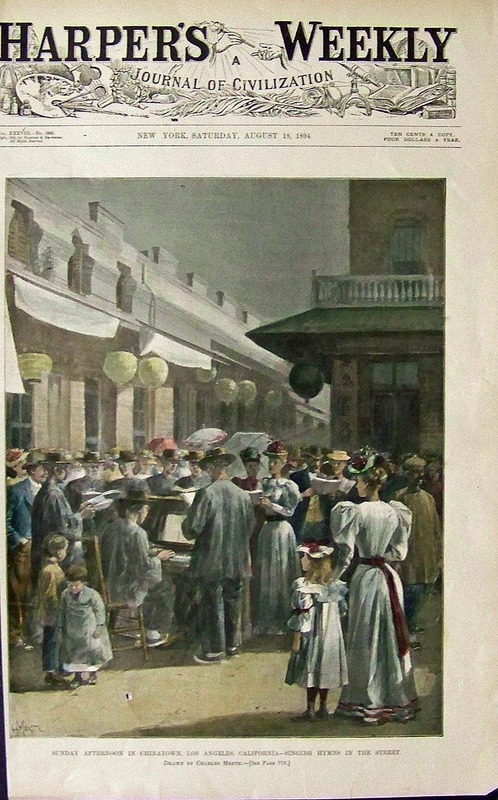 1888 Los Angeles Scene by Albert E. Sterner. 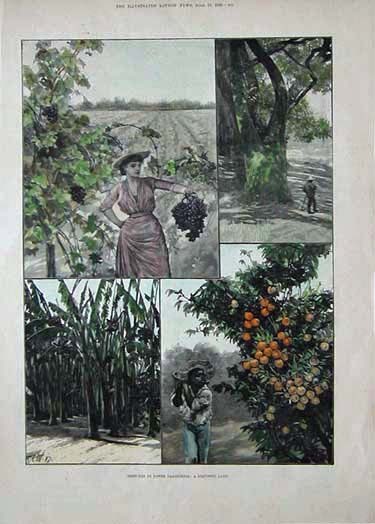 Hand colored lithograph titled "Under the Fan Palms (Types of Early Days in Los Angeles)," printed in 1888. Based on a painting by Albert E. Sterner. 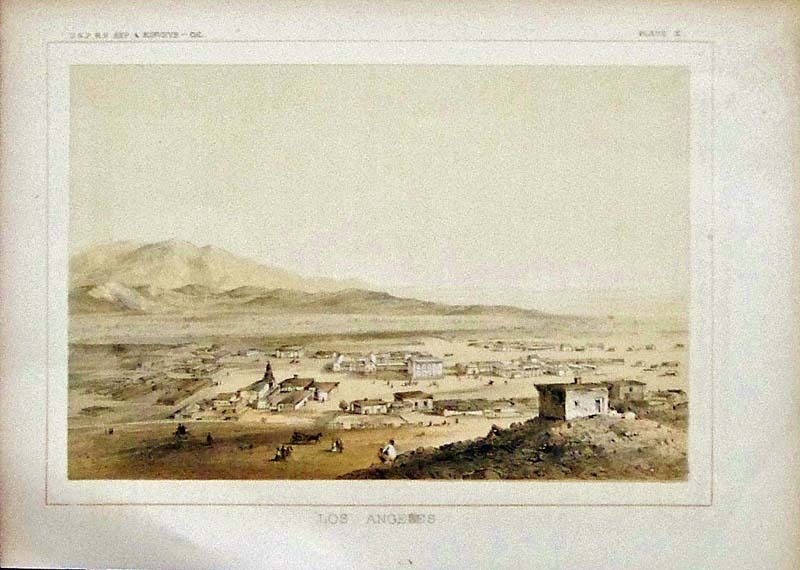 1855 Color lithograph showing, "Los Angeles," being its first printed view. Featured in the U.S.P.R.B. 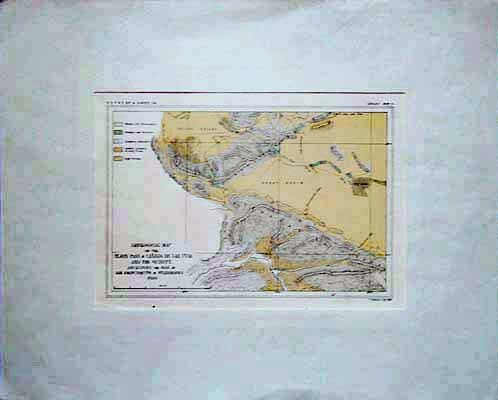 Expedition & Surveys - Cal. 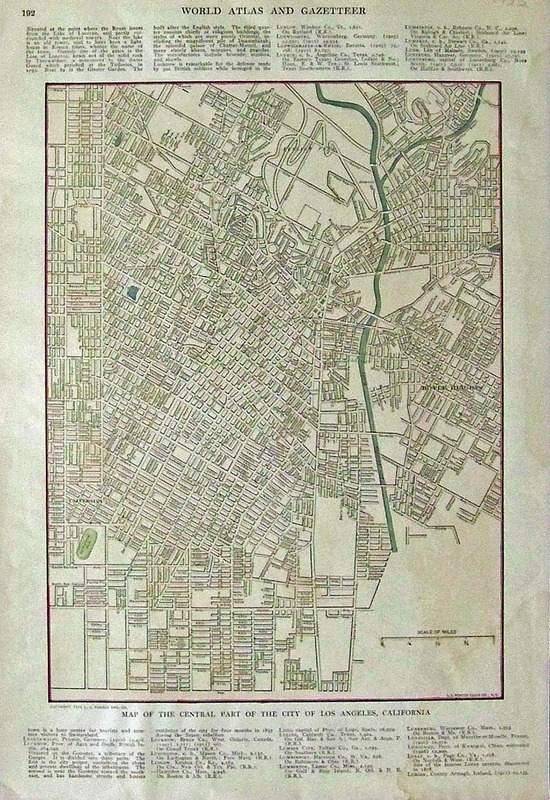 1922 Hand colored lithographed Map of the Central Part of the City of Los Angeles, California. 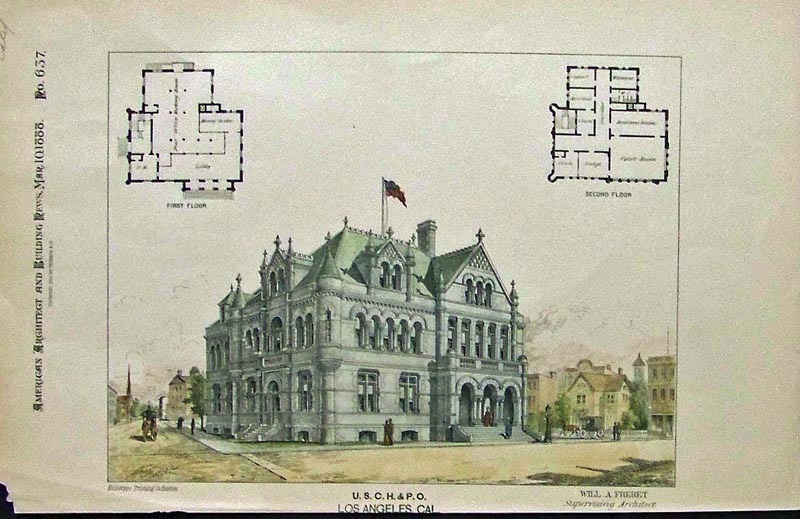 Featured in the World Atlas and Gazetteer. 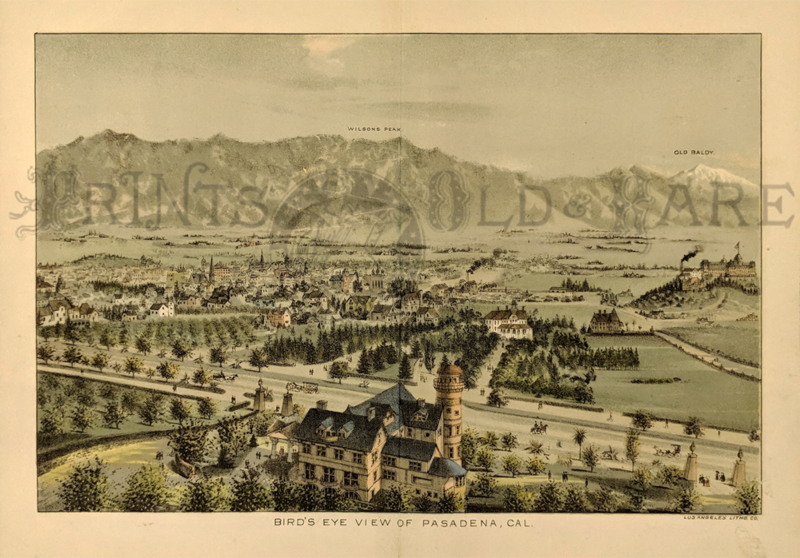 Bird's Eye View of Pasadena, Cal. 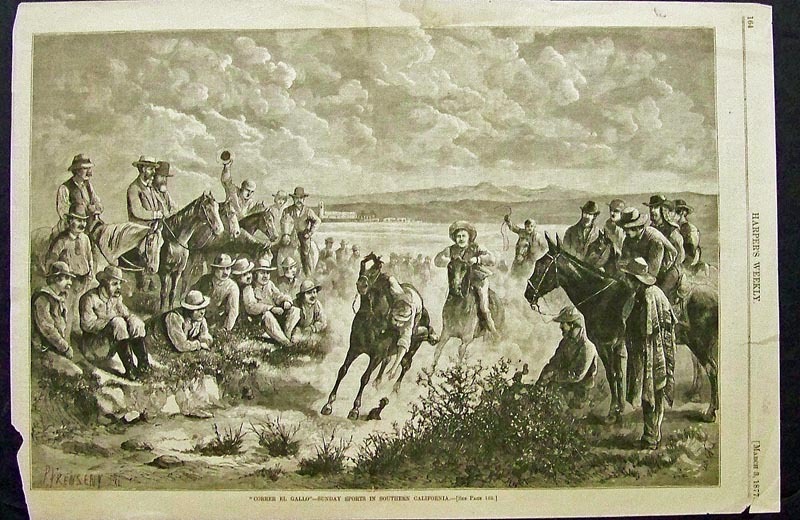 by Los Angeles Litho Co. 1892 colored lithograph. Wilsons Peak & Old Baldy labled in the backround. 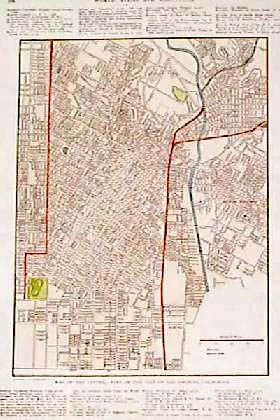 1925 Map of Los Angeles. 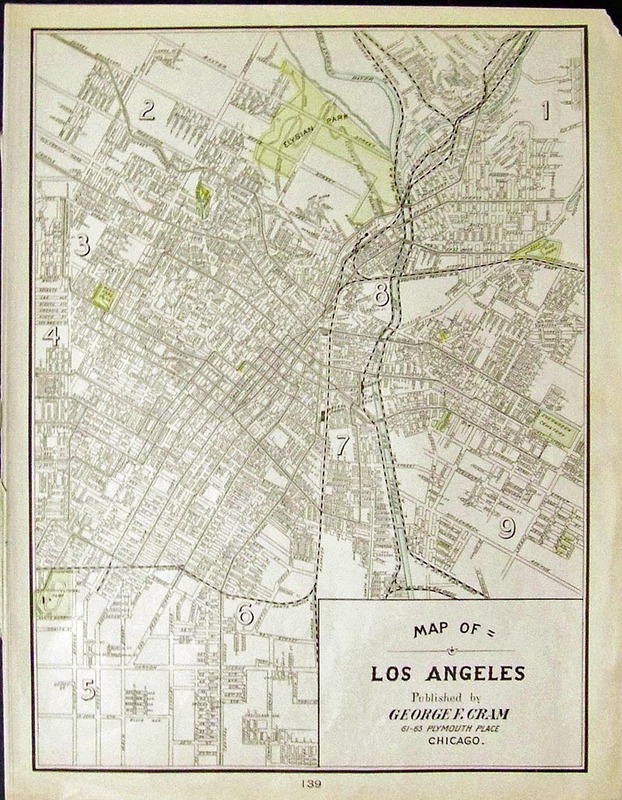 Folded map in “Rand McNally Lost Angeles Guide.” Map of underdeveloped Los Angeles, roads, railroads, L.A. river and small towns. Map: 21 x 28 in. 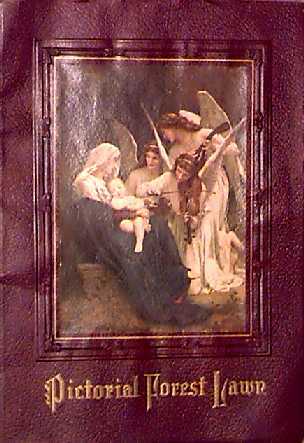 Book: 5 x 7 1/2 in. San Bernardino & Rim of the World Drive Map. 1931 issued by Chamber of Commerce. Wealth of information on verso: Text on history, climate, treasures, rental costs, valuation, public utilities, entertainment. 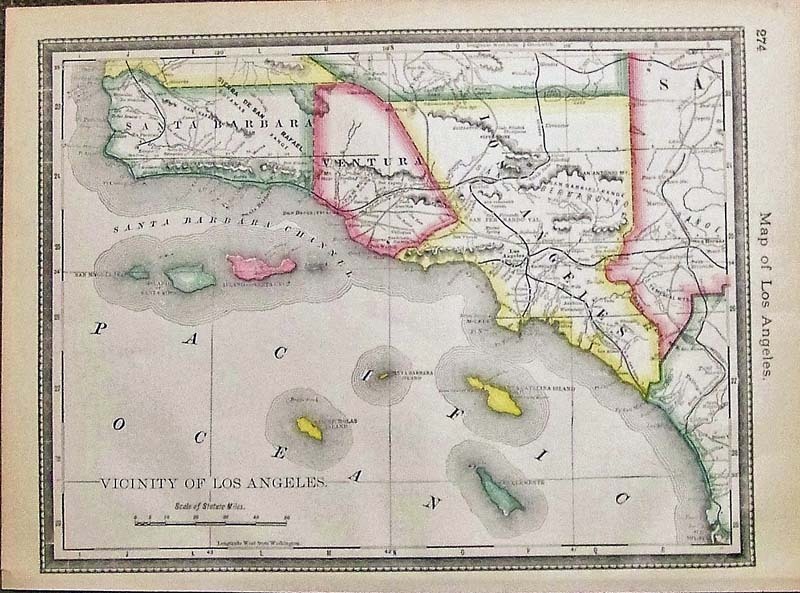 Plus, maps of 101-mile Rim of the World Drive and principal highways of Southern California. *Tan stain a corner fold. 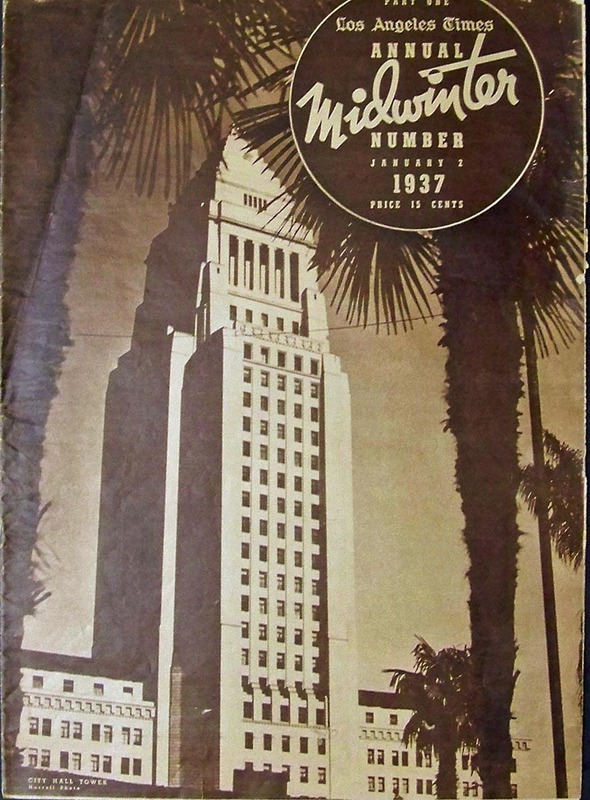 1937 Half-tone issue of the Los Angeles Times showcasing the Annual Midwinter Fair - a full ten pages. 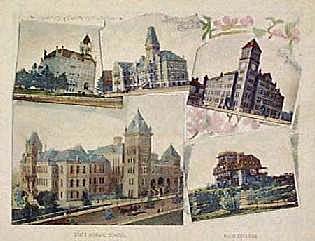 Image on front cover shows the City Hall Tower. 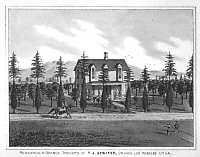 1887 Photogravure showing The Pasadena famous Raymond Hotel in image titled, "Raymond, South Pasadena, Plate 39." 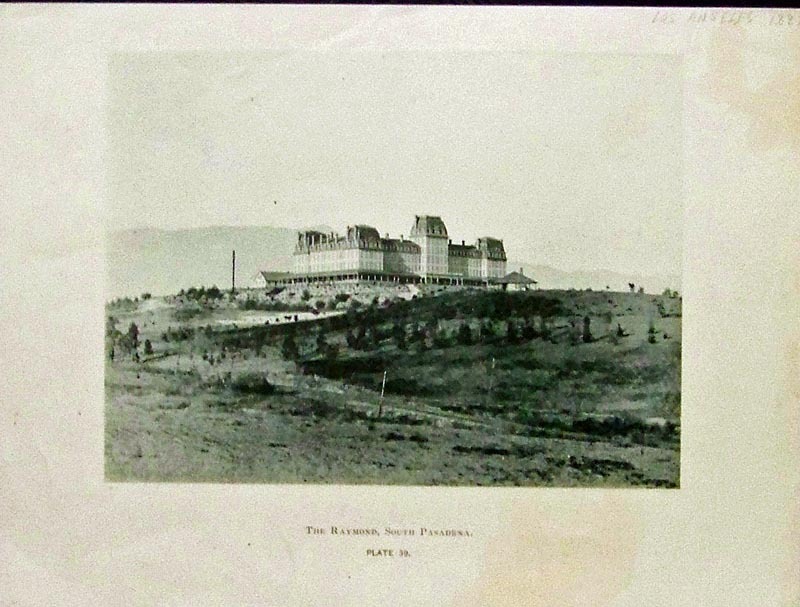 Published by American Photogravure in Chicago, IL. From Picturesque Los Angeles County, California. 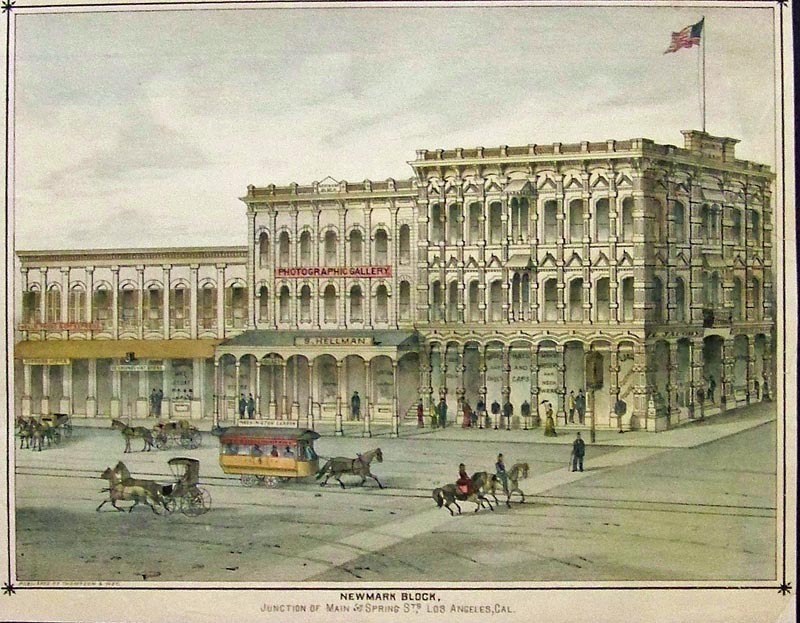 C.1886 Hand colored lithograph showing the Newmark Block in downtown Los Angeles, California. 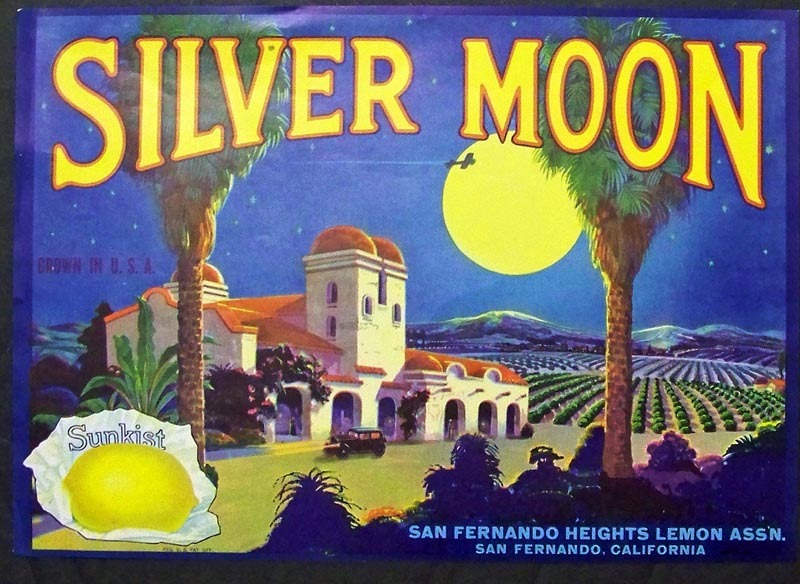 C.1900 Color lithographed Silver Moon fruit label from San Fernando Heights Lemon Association in San Fernando, California. 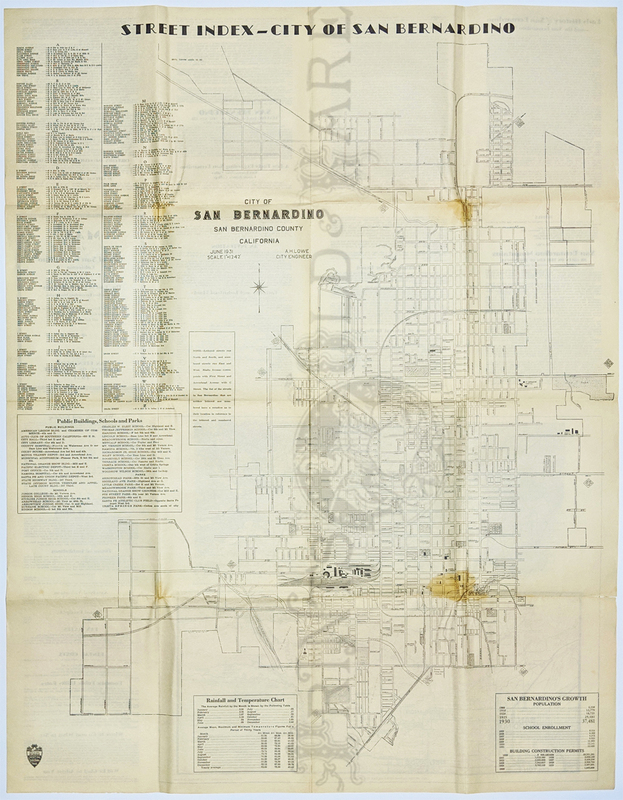 The San Fernando Mission is shown on label. 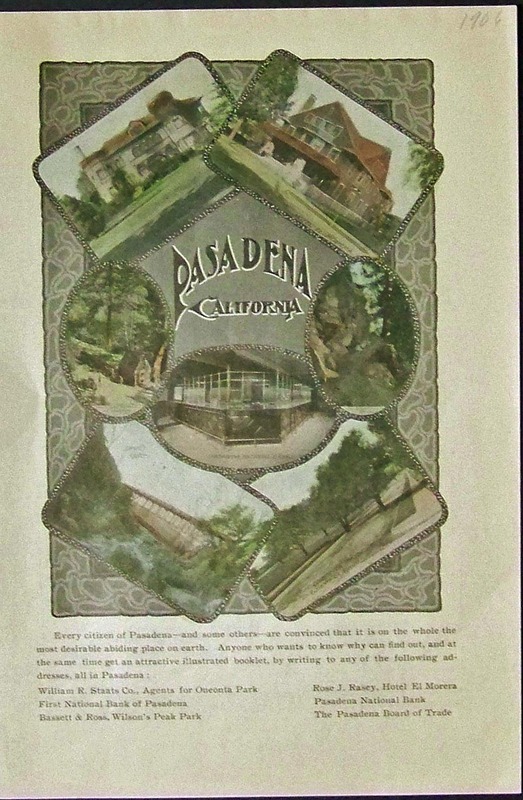 1906 Hand colored half-tone showing a Pasadena real estate advertisement which features luxurious properties. 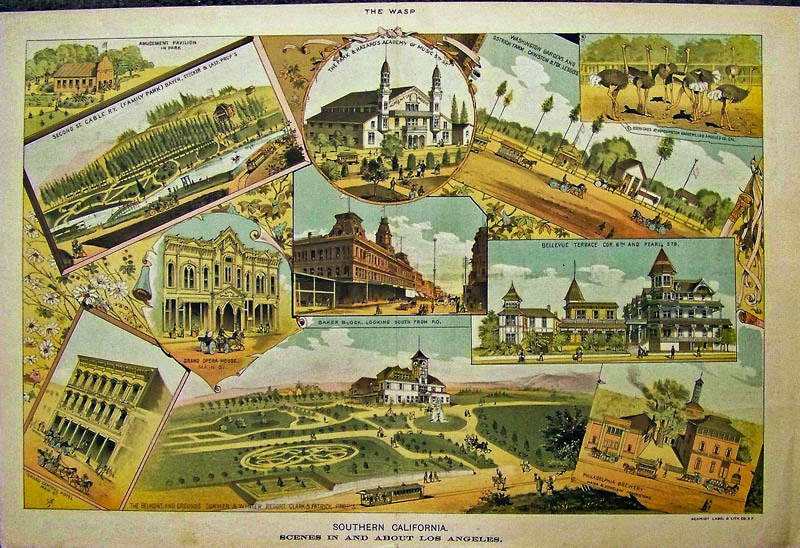 1890 Hand colored wood engraving showing several views of The City of Los Angeles, California. A great collage. Drawn by Charles Graham.Featured in Harper's Weekly. 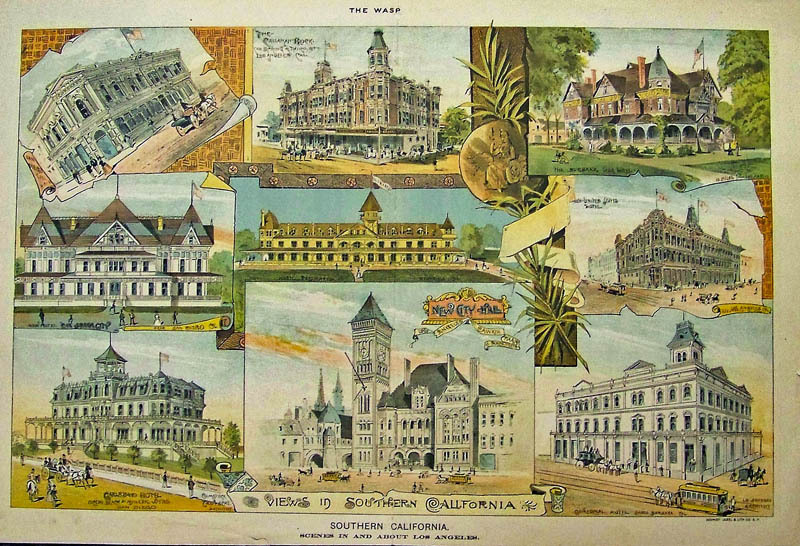 C.1895 Scenes In and About Los Angeles -- Chromolithograph featuring Southern California scenes showing the Grand Central Hotel on Main Street; Washington Gardens and Ostrich Farm; Baker Block; Philadelphia Brewery, Bellevue Terrace; the Belmont, and Grounds' Summer and Winter Resort; the Grand Opera House. 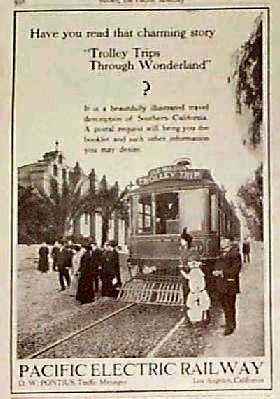 the Park & Hazard's Academy of Music; and other Los Angeles-area attractions. 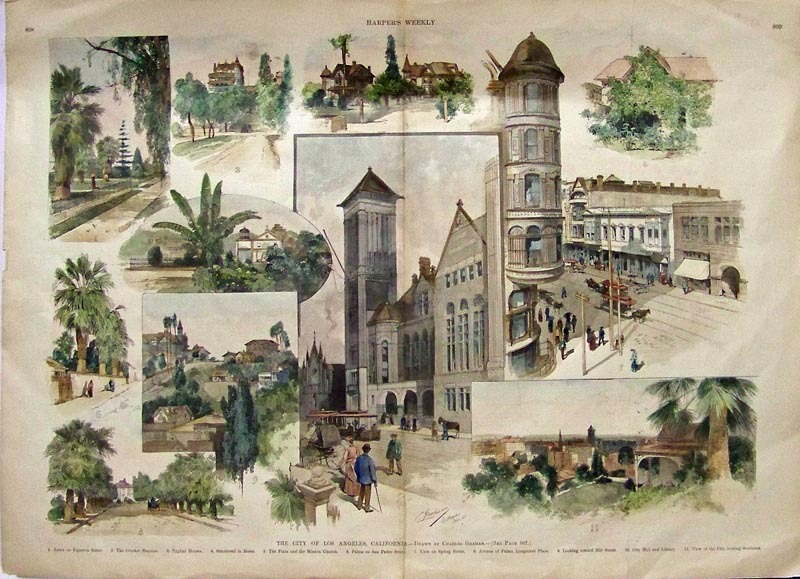 Lithograph by Schmidt Label & Lithograph Company, San Francisco. This is a very rare Wasp centerfold.